The SWOT Analysis is a tool to identify strengths, weaknesses, opportunities, and threats of your organization. 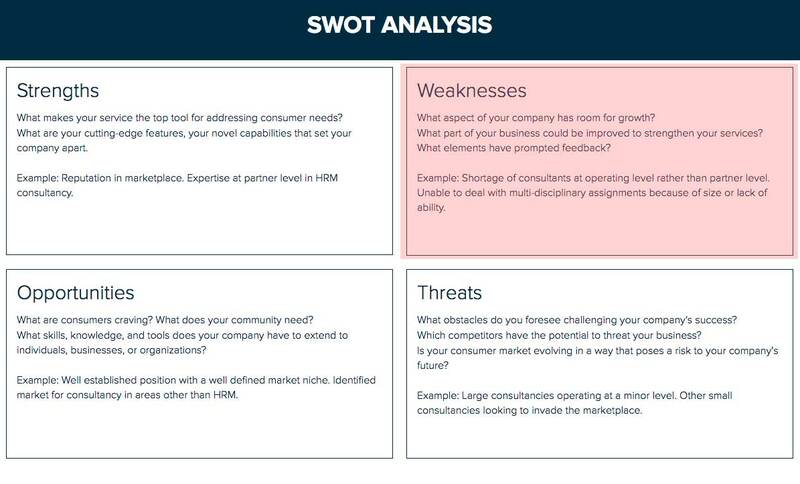 A SWOT Analysis can be applied to many different objectives such as evaluating a new business idea or success of a product, being able to further understand the competitive landscape or simply for personal development. 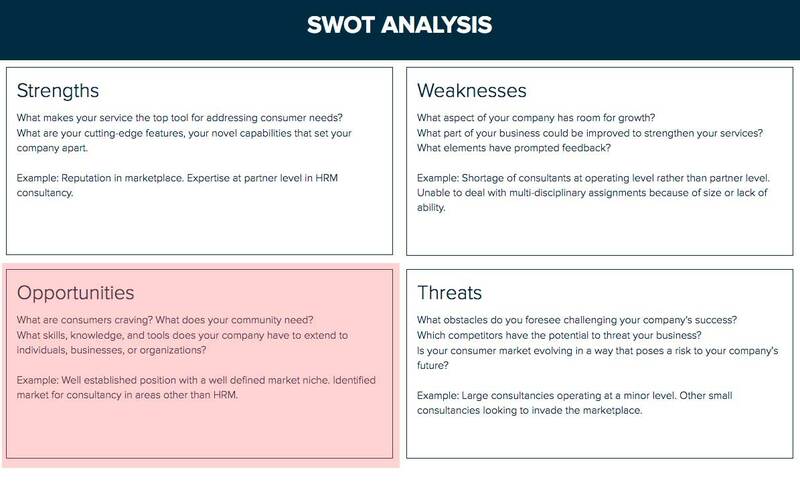 Defining a clear objective is the first key step to doing an effective SWOT Analysis. 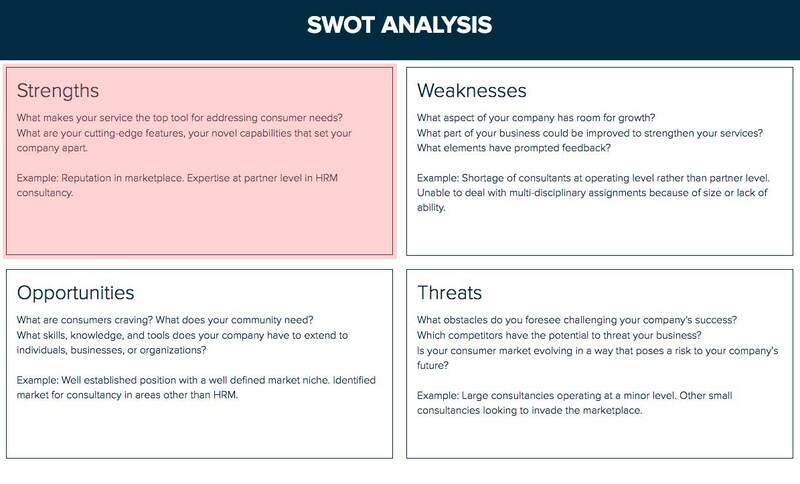 Do a SWOT Analysis - It's free! Your starting point to create and share a beautiful and effective SWOT analysis, without any design experience. What sets you apart from your companies? What is your competitive advantage? To find out, take advantage of our free competitive analysis template. What assets does your company have? What do customers like about your company? What are the features that help your company make a difference? While listing your company’s strengths, focus on the core elements that brought your company to the point it’s at. These core values will help you overcome future risks and threats. Plus, understanding what your company does well will guide you while outlining effective business and marketing strategies. On the opposite spectrum, your company’s weaknesses are equally as important in understanding where you stand in the market and how you can improve your business and marketing strategies. It’s not easy to identify and accept your company’s downsides, but the better you indicate these factors, the quicker you will be able to take actions towards solving them. What is not working for your company? What are your customer’s main complaints? If you needed to change one thing in the company, what would it be? Does your company have any disadvantages? Bonus: Have your customer support agents fill out the User Persona template to get a better understanding of who your customer’s, what their problems are and what they want to see in a solution. What are some external sources that could potentially be used in your company’s favor? What could be the next best move for your company’s growth? Did you consider entering into any new markets? Your product or service might not be performing the best in the current market you’re putting efforts into, but you may want to consider a more cost-efficient market that could end up being a game-changer. What do your customers want? A new product, feature or service to be considered? Any possible partnerships? Look into who/what can help your company make an impact. Here’s one of the most difficult steps to identify. Threats are also external factors that you will have to acknowledge and analyze for your company’s success. Many companies fail to consider the threats to their business, whether it’s a threat caused by the market, competitor or simply a financial threat as a result of increased resource costs in relation to revenue. Here’s how you can identify your company’s threats. Do you really know who your existing competitors are? You might be doing everything right, but a step your competitor takes can turn things upside down. Consider your competitors as a potential threat to your success in the market and make sure to stay up-to-date on the competition. Are there any political or economic risks in the market you’re operating in? 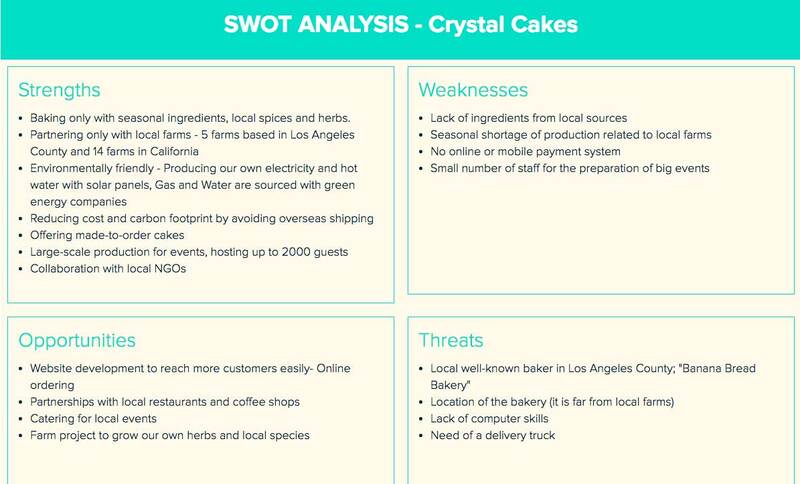 Ignoring these risks can cause a big and unexpected failure, this is why SWOT Analysis is important- to help you to identify and consider them in advance. Is your market growing? Or are there emerging industries that threaten to take over your market? What is the cost of your resources? Is it increasing? 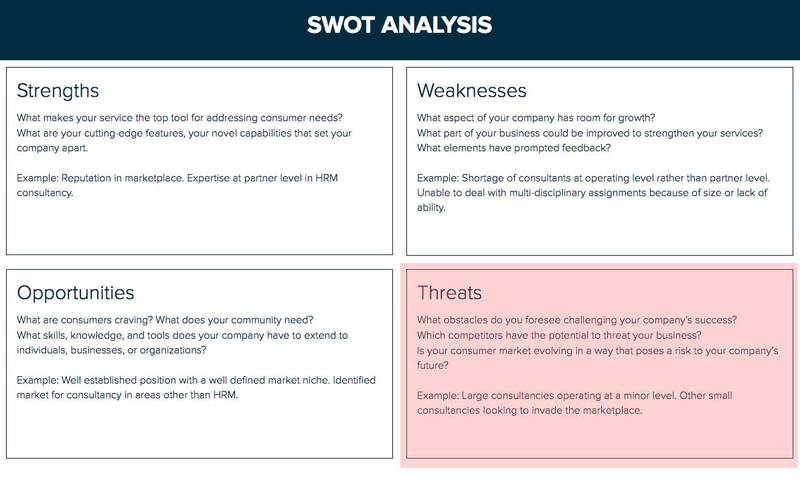 Conclude your SWOT Analysis with a well-defined strategy. How will you use your strengths to overcome threats? How will you improve your weaknesses to take advantage of opportunities? The only way to improve a SWOT analysis is to collaborate as much as possible and get others to share their ideas about the company. A local business professional from the market of entry can definitely add a few or more points to threats. And your Customer Service Specialist can fill up the weaknesses easier than you can since they regularly talk to your customers. 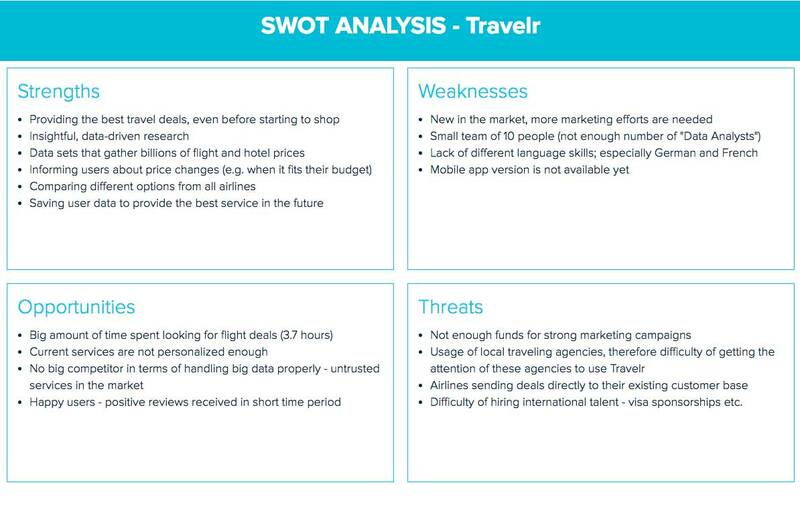 Getting their insights means a powerful (and more realistic) SWOT analysis. Xtensio’s features allow you to collaborate easily, flexibly share your SWOT Analysis as a variety of outputs and control access levels with ease.